Richie Booth is a 2005 graduate from Northwest High School. In the 2004 cross country season, Booth finished 8th in the county and 10th in the state, helping his team to a second place overall finish in the county and in the 3A state classification. As a member of the University of Maryland cross country and track program, he has progressed gradually to become a contributing member on the team. At last year's Mid-Atlantic Regional Championship, he ran 31:30 for 10k, improving 50 spots and nearly two minutes from the previous year. As he heads into his senior year, he reflects on what the whole experience has been like for him. MoCoRunning: Did you search around a lot before choosing UMD College Park? How did you know it was right for you? Booth: I applied to a bunch of engineering schools but was just real pumped about studying and running at Maryland. The cross program at MD was getting revamped when I came in as freshman, and I really wanted to be the start of something on its way up. MoCoRunning: I've noticed that a lot of great athletes choose to go to UMD, but stop running because they feel they are not good enough to run for the school team. What options are available to runners besides giving up running altogether? Booth: Club running is always an awesome option. I know a bunch of people who came out of HS that loved to run but weren�t necessarily fast enough to run on the school team. 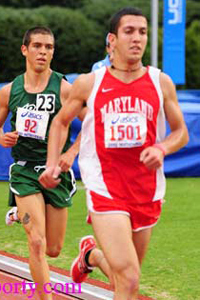 At MD, there is the Terp Runner club, where a lot of runners from high school still continue to run. They all meet up to run every day and run at local road races (all race fees paid for by UMD Recreation Center). MoCoRunning: How would you say you made most of your friends at college park? Through cross country? Engineering? Dorm life? Other activities? Booth: Starting freshman year, I lived in academic housing and loved that experience. It really allowed me to branch out and meet people. But as I have gone through subsequent seasons, I got really close to the guys on the team. When you're spending so many days running and traveling together, everyone really pulls together and it becomes more of a family than a team. MoCoRunning: What are engineering courses like at College Park, especially in your first two years? Booth: Engineering is a pretty tough major and going into school, my best advice would be to just enjoy school and the social life. Take school seriously, but it's so much more important to get out and meet people. Some people get too focused in school and forget to enjoy college. MoCoRunning: Where are some of the places that the UMD cross country team goes for training runs? Booth: We got a couple loops that we usually run. One loop is the Greenbelt loop (about 2 miles from campus), which is dirt 6 mile loop that we are pretty faithful towards. Another is the UMD Golf Course, right across the street from Denton Hall that is pretty hilly. One of my favorite spots to run is definitely the C&O Canal. We�ll drive down there to do tempo workouts on Saturdays and do some long runs on Sunday, since it's flat and you can really get rolling on it. MoCoRunning: You are running high mileage now, but what type of mileage did you run in high school? Was there one year when you really bumped up the mileage or has the increased volume been a steady progression? Booth: High school was really low mileage at NW. We did a lot of quality sessions and I averaged around 25-30 probably. I was really na�ve about running and I thought I was a badass for running 30 miles a week. So I was in for a pretty big shocker when I came to UMD and realized people were running double my mileage. I think the key to running higher mileage is just slowly, consistently raise over time. It�s probably not the best idea to kick your mileage up if your not adjusting properly. Freshman year, I averaged 50, sophomore was about 65, last year was 75-80 and this summer I hit weeks of 90. MoCoRunning: It seems rare nowadays that Division I athletes do four years of college without redshirting, but it looks like you will accomplish that. Is there any trick to keeping your grades up, staying healthy and improving your times over a vigorous four year period? Booth: The biggest trick in life is learning to �compartmentalize� your life. Being able to separate different aspects of your life and not allowing any one aspect to monopolize you. I try to separate everything into 3 distinct categories of school, running and social life. In the school mind-set, I really try to key in on academic stuff. When I�m at practice, I totally phase out school and really concentrate on hitting the pace I need and the upcoming interval. Thinking this way keeps you balanced and results in just being a well-rounded person. MoCoRunning: What is the outlook for this year's Terrapin cross country team? Booth: I am psyched about this year for cross. Last year was our first year under Coach Weir so we were all transitioning into the new philosophy. Being under the system for a full year, everyone is feeling really acclimated and is ready to run tough and improve from last year. We are looking to sneak into the top 5 team spot at ACC's and really surprise some people. MoCoRunning: Has there been any sort of change in philosophy since Coach Weir took over the distance program a year ago? Booth: With Coach Weir, there is a huge focus on hard/easy days. On our workout days, we�ll do double sessions and really key in on these days. On rest days, it�s all up to you and the flexibility is really appreciated it. It allows you to fit runs in around possible academic conflicts. But once that workout day hits, you better be focused and ready to run fast. MoCoRunning: Is it important to you that the Maryland cross country and track programs continue to grow after you graduate? Booth: I really have come to love running by being on the team and I want the team to succeed in the future. In the future, I want the team to have more Moco kids to be running fast and reppin Moco for the Terps! MoCoRunning: What are your priorities after graduation? Does running, or maybe even coaching fit into your plans? Booth: After graduation, I really want to travel for a bit. I didn�t get a chance to study abroad while in school (school/running) and am really looking forward to seeing the world a little bit and delaying responsibilities/bills/reality. Thanks a lot for having me on MocoRunning and best of luck to everyone this cross season! Go JAGS! !